Bring a bit of the beach to your home by placing all of those shells you collected at the beach into an apothacary jar. You can group similar seashells together or just place in an assortment. 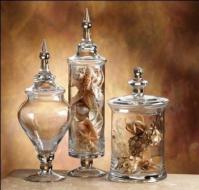 Then place the jars on a mantel, counter or a bookshelf. A great idea for a bathroom or family room. Make sure you wash your shells before placing them in the jars! For more great ideas visit www.cheapchicdecor.com.